Boulder, CO, April 09, 2019 --(PR.com)-- 8z Real Estate is pleased to be named in two national rankings released in March, the Real Trends 500, and RISMedia’s Power Broker report. Both ranked brokerages by their 2018 production. The Real Trends 500 report was released last week ranking the top 500 brokerages in the United States by production metrics. REAL Trends is a real estate publishing, consulting, and communication company. With over 1700 brokerages across the country submitting production data for 2018, the Real Trends 500 recognizes elite-performing brokerages. · 102nd among Independent Brokerages by transaction sides. 2018 marked a milestone for 8z Real Estate, having closed over a billion dollars of real estate during the year. Real Trends recognized 297 brokerages in their “2019 Billionaires’ Club.” 8z achieved a 10.3% growth in sales volume from 2017 to 2018 to meet this milestone and reach its first ranking in the Billionaires’ Club. Additionally, 8z Title was recognized in the Real Trends 500 Core Services for having closed 998 units in 2018. RISMedia, a real estate news agency, released their 2019 Power Broker Report, ranking the top 500 brokerages based on 2018 sales volume. RISMedia also collects data and insights from the survey responses of the top 1,000 ranked respondents, yielding unique insights to the real estate industry in their annual report. 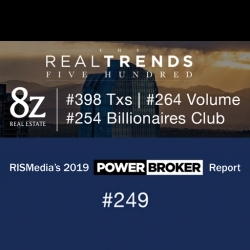 8z Real Estate was listed 249th by volume in the 2019 Power Broker rankings. 8z was one of only 24 brokerages in Colorado to be named to the 2019 Power Brokers. 8z Real Estate is a residential brokerage that empowers buyers and sellers with unmatched market data and online tools, combined with the knowledge and expertise of professionals on the ground. Each Realtor specializes in a specific community, to develop expertise on everything local. 8z puts clients first with Realtors who listen to their clients’ needs, address their concerns, and deliver solutions so that each client has clarity, control and confidence in their real estate transaction. 8z has been recognized as the Denver Post’s #1 middle-sized Workplace in 2017. For more information call 303-563-4103 and visit 8z.com.